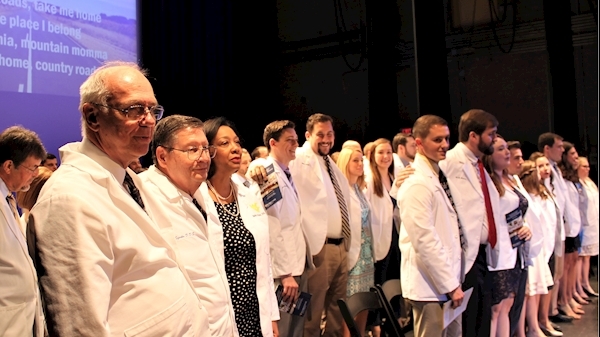 The West Virginia University School of Dentistry Clinic Induction Ceremony has become a tradition of recognition and rejuvenation within the school. Following two years of intense academic study and pre-clinical training, students transition into the arena of their aspirations. They begin to engage in direct patient care. On Saturday, August 25, 2018, faculty, family and friends observed the progression of the 46 men and women who make up the Class of 2020 in a formal ceremony reinforcing the drive and motivation of our future dentists. Students recited their commitment to excellent standards of practice. And, the highlight of the rite of passage was the moment students received their white coats, a cloak of compassion reminding them that proper treatment must be delivered with empathy and care. See our facebook album for some ceremony pictures. Dr. Shelia S. Price, current Associate Dean for Admissions, Recruitment and Access, established the School of Dentistry’s Clinic Induction Ceremony in 2000, she imagined an annual event as a platform for dental students to reaffirm their dental career choice and signify unequivocal dedication to excellence in patient care. “This ceremony is strategically placed at a pivotal and progressive time in dental students’ education. The white coat represents the wearer’s steadfast commitment to deliver competent and compassionate oral healthcare. Acceptance of the white coat signifies each individual’s unyielding receptivity and responsibility to provide excellent dental care to people from all walks of life.The significance and opulence of this occasion will endure,” Price said. The initial ceremonies were sponsored by the West Virginia American College of Dentists and the School of Dentistry Alumni Association. Congratulations and good luck to the Class of 2020 whose members are now accepting patients.